Mix the carrots with the parsnips and pine nuts. Whisk together 2 tbsp olive oil, vinegar, mustard and seasoning, toss with the grated vegetables, then mix with the rocket. Heat the remaining tsp of oil in a non-stick frying pan and fry the tuna steak(s) for 3–4 minutes, turning once. 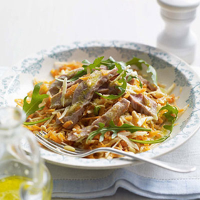 Cut the tuna into strips and toss with the salad. Pile into a serving dish.